The Cord 810 is one of the immortal designs of the American automobile industry. Editor’s note: This is the seventh in a 10-day series featuring significant cars to be sold this month at Barrett-Jackson’s Palm Beach Auction. The Cord 810 is one of the immortal designs of the American automobile industry. Selected for exhibition at New York’s Museum of Modern Art, Gordon Buehrig’s hidden-headlight and “coffin-nose” Cord is a triumph of clean, sharp and efficient modern Machine Age design. In his patent application, designer Buehrig described the “New Cord of 1936” as being a “new, original, and ornamental design for an automobile.” That was a classic understatement. The Cord boasted extremely aerodynamic styling, with a louvered hood that lacked a traditional radiator shell and headlights hidden in the curve of the front fenders. Unitary body construction and a “step-down” floor that predated, by a dozen years, the Hudson that made those features famous. The door hinges were hidden and there were no running boards, because the Cord did not need them. The front-wheel drive technology lowered the car’s ride height by several inches compared to other American automobiles. Driving those front wheels was a powerful Lycoming V8, which was mated to an advanced electrically shifted pre-selector transmission. 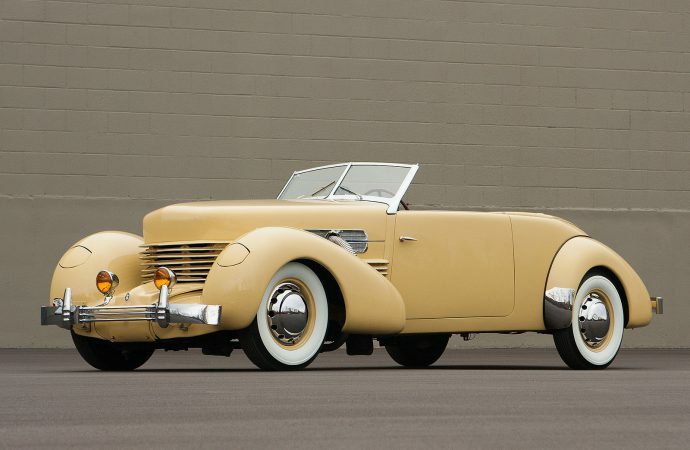 This 1937 Cord 812 Phaeton is an absolutely gorgeous, properly restored example that is a strong runner as well. Finished in the characteristic color of Cigarette Cream with burgundy leather interior, and complimented by a black Haartz-cloth top. The exterior has outside exhaust pipes, original chrome hubcaps, correct cord fog lamps and wide whitewall tires. This elegant Phaeton reportedly runs and drives extremely well with a healthy, throaty rumble from its V8 and a smooth-shifting 4-speed gearbox. Barrett-Jackson’s 13th annual Palm Beach Auction is April 17-19 at the South Florida Fairgrounds. Coverage of the event will be broadcast on Velocity and Discovery during 19 hours of live, high-definition television beginning Friday, April 17, at 12 p.m. EDT.